For many communities, promoting job creation is job one. How can city planners stoke the employment engine of industry while keeping their communities green and clean? Sustainable Urban Industrial Development makes the case for local industrial policies geared to the needs of cities and suburbs. Authors Leigh, Hoelzel, Kraft, and Dempwolf set forth strategies for selecting sites where people who need the work can get to the jobs. The report covers best practices for job training, industrial incubators, and support for entrepreneurs, including women and minorities. Economic development planners will learn how they can expect manufacturing to affect local tax revenues and the cost of city services. And city planners will find fresh ways of thinking about brownfields and the place of industry in smart growth. Case studies show how innovation and inspiration have paid off for large cities and smaller urban areas across the United States. 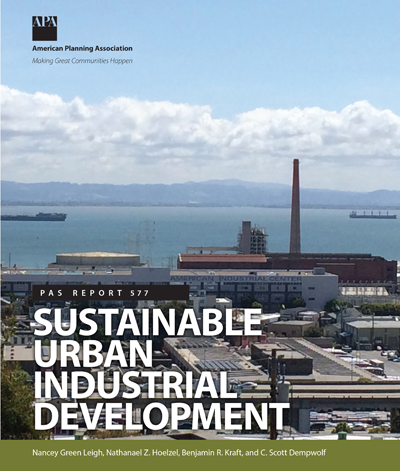 Readers will come away with a better understanding of the planner’s role in putting industrial development to work.